Hyde Park, in Chicago, is where President Obama called home before moving to Pennsylvania Avenue. I once called 5118 S. Dorchester home. Hyde Park is a college town surrounded by – but not really part of – a big city. 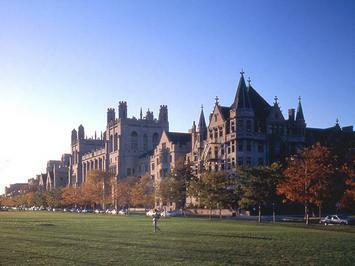 The University of Chicago, founded in 1890, is the heart of the community. The campus was built of Indiana limestone, fake Gothic, and made to look old from its very inception. Some people like it. In 1893, Hyde Park hosted the World's Columbian Exhibition (a year late). This showcased the new campus, and also what is now the Museum of Science & Industry, at the northern edge of Jackson Park. The Midway Plaisance – as in carnival midway – then a canal traversed by Venetian gondolas, now marks the southern boundary of Hyde Park. The tradition continued with Robert Maynard Hutchins and Mortimer Adler – the latter founder of Encyclopedia Britannica, and both authors of the Great Books model of liberal arts education. Subsequent residents have included Muhammad Ali, William Ayers, Saul Bellow, and Barack Obama. The community is bordered on the east by Lake Michigan, on the west by Washington Park (as in green grass – where few white residents dare to picnic), on the south by the ghetto community of Woodlawn, and to the north by Kenwood – also mostly a ghetto. The formal northern boundary is Hyde Park Blvd (51st St.), but really the neighborhood extends a couple of blocks north into Kenwood. Including this (say to 49th St.), Hyde Park is less than two square miles, and has about 30,000 people. To preserve its integrity as a college town, the area is separated as much as possible from the surrounding ghetto. As a result, public transportation to and from Hyde Park is poor to anyplace besides the Loop. It is difficult to get to Hyde Park from nearby communities. This is what gives it the feel of a separate village. It takes half an hour to get to the rest of Chicago. The Illinois Central tracks bisect Hyde Park along Lake Park Ave. East of the tracks is a lakeshore community, traditionally Jewish. Here are high-rise condos such as one would find on the North Side. The famous and impressive Shoreland Hotel has become a college dormitory. Hyde Park Blvd. turns south, east of the tracks, and is a very impressive avenue leading to the Museum of Science & Industry. A pedestrian tunnel leads under Lakeshore Drive to the marvelous Hyde Park Point – a peninsula jutting out into the lake. This offers the very best view of the Chicago skyline from anywhere in the city. Drive to the very end of 55th St. and you're there. The town-gown divide runs right along 55th Street: south is gown (and mostly white), north is town (and majority Black). The entire community is racially integrated – one of the defining features of Hyde Park. Nevertheless, east of Woodlawn and south of 55th Street is mostly faculty and graduate student housing. Conversely, the northwest part of town is predominantly Black. 55th Street itself is very boring – the victim of urban renewal in the 60's and 70's. The only interesting place is the Lutheran School of Theology at Chicago, a modern but very satisfying building. (On my last visit the building looked to be in disrepair). The commercial main street is 53rd Street from Woodlawn to Lake Park. I am pleased to say that while individual businesses have come and gone, the character of this street is mostly unchanged over the past 30 years. Half white and half Black, half university and half blue-collar, the street is a great place for people-watching. The center is a small shopping area known as Harper Court. When I last visited, the Valois Cafeteria (53rd and Blackstone) was still there – great place! Four blocks south is 57th Street, the main street of the campus neighborhood. This used to be justly famous for fantastic bookstores, and probably still is. Please visit the Seminary Co-op Bookstore at the corner of 58th and Woodlawn. (It's inside the Chicago Theological Seminary building, in the basement; there are small signs.) A less interesting branch is along 57th Street. A small used bookstore on 57th Street just before the tracks is still there (called Powell's, but probably unrelated to the Portland store). I'm certain all the other independent bookstores are gone. The university proper starts at Woodlawn and extends west. The impressive Rockefeller Chapel is on Woodlawn south of 58th Street. Frank Lloyd Wright's justly famous Robie House is at 58th and Woodlawn. The main quad of the university extends from 57th and University all the way to 59th and Ellis. It is well worth exploring. If you can, go into the Harper Library. And walk past the Divinity School. The unforgivably ugly Regenstein Library is across 57th Street – classic brutalism. West of Ellis is a huge medical complex: the University of Chicago hospitals. This neighborhood is very different still, as neither nurses nor patients live in Hyde Park. The academic core of the university extends west of Ellis as well, and now includes a Science Quad. By the time one gets to Cottage Grove – the western boundary of Hyde Park and the eastern limit of Washington Park – one is actually in the ghetto. I never felt safe walking along Cottage Grove. Indeed, except for the university campus, I rarely ventured west of Ellis. Otherwise I walked around town at all hours of the day or night. The campus has crossed the Midway Plaisance, and now includes a row of large buildings along 60th Street – notably the law school. This is a wall against impoverished (and increasingly uninhabited) Woodlawn. I understand that one additional building needs to be built in Hyde Park: the Obama Presidential Library. Please let the White House know where you think they should put it. The matter is of some urgency. I'm hoping they can start construction no later than 2013. Submitted by johnz308 on Sat, 06/06/2015 - 13:42. Submitted by johnz308 on Sat, 06/06/2015 - 12:37. Submitted by johnz308 on Thu, 05/28/2015 - 14:13. Submitted by johnz308 on Wed, 05/27/2015 - 22:28. Submitted by carlz24 on Wed, 05/27/2015 - 00:39. Submitted by ymouel on Mon, 05/25/2015 - 07:46. Cool Find! It's good to get some coffee today and post some comments here more often. That was so perfect !! . Submitted by glad on Thu, 05/21/2015 - 02:03. That was so perfect !! . It's such a great post !! Submitted by vanityme on Fri, 05/15/2015 - 00:40. I definitely satisfied and enjoy of reading this article.